1. How much time to allow? 4. Are the attractions stroller and handicap accessible? 5. Is there food available at the attractions? 6. Are pets allowed at the attractions? 7. Do you offer group rates and discounts? 8. Where can I get information on the individual attractions? 9. Where can I get information on visiting Chattanooga? *Times listed above are only approximations. They do not allow for meal times, shopping, or any wait time associated with high volume days. It is suggested to wear weather appropriate clothing when visiting the Lookout Moutain Attractions. Most importantly, comfortable walking shoes. ►Rock City - Is an outdoor attraction, but is on top of the mountain. The temperature is generally just a few degrees cooler than in the valley. ►Ruby Falls - The Ruby Falls cave has a standard temperature of 60 degrees, but due to the high humidity, it feels more like 70 degrees year round. ►Incline Railway - The train itself is enclosed, but the observation towers on top of the mountain are outside and are generally a few degrees cooler than the valley below. ►Ruby Falls - The Ruby Falls trail is a little less than 1 mile combined in and out. There are 30-35 stairs on the trail that come in sets of 4 and 5. The tour to Ruby Falls is guided. ►Rock City - The Rock City trail is a little under a mile in total. There are stairs throughout the trail. The Rock City trail is self-guided and one at one's own pace. ►Incline Railway - The Incline itself is a trolley-car style ride, although you will have to climb stairs for the observation towers. Civil War points of note Battles for Chattanooga and Point Park are only a 3 block walk from the top station. >Strollers: Due to some narrow passages, strollers are not allowed inside Ruby Falls' cave. We recommend bringing an infant backpack or even better a front carrier. >Handicap Accessibility: Ruby Falls' main building is fully handicap accessible. Regretfully, the cave tour is not wheelchair accessible due to some narrow passages and stairs. >Strollers: Due to some narrow passages along Rock City's trail, strollers are not allowed. We recommend bringing an infant backpack. >Handicap Accessibility: Rock City is partially handicap accessible. A handicap accessible trail is available for guests in wheelchairs or with limited mobility to visit the overlook at Lover's Leap for the 7 States View. Round trip distance is about 1/2 mile. >Strollers: Incline Railway allows the umbrella-type strollers on the cars, but only folded up and carried onboard. >Handicap Accessibility: Both the Incline Railway's Top and Bottom Stations are fully wheelchair accessible but the cars are not. A folding wheelchair is allowed on the Incline train, but the person must be able to step onto the car. ►Rock City - Several dining options are available at Rock City. Year round food is available at the Big Rock Grill (short-order style dining) and Cliff Terrace (pizza). An additional sit-down restaurant option, Cafe 7, is open seasonally. Home-made Rock City fudge and other candies are also available. Starbucks is located just outside the Ticket Plaza. ►Ruby Falls - Ruby's Kitchen offers grab-and-go food inlcuding individually wrapped sandwiches and snacks. ►Incline Railway - The top station offers pizza and the bottom station has an Ice Cream Shop. ►Rock City allows pets on a leash. ►Ruby Falls does not allow pets, however, an on-site kennel is available. ►The Incline Railway does not allow pets. 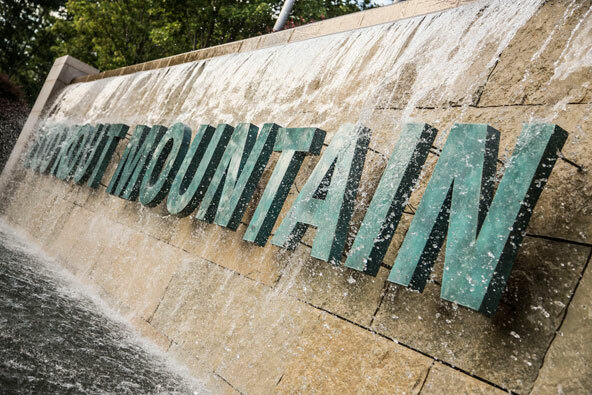 All three of the Lookout Mountain Attractions offer Group discounts. For more information, visit our groups page. For detailed attraction specific information, follow the links below or contact us if you have additional questions. The Chattanooga Area Convention and Visitors Bureau's website ChattanoogaFun.com is an excellent source for information on Chattanooga and the surrounding area. It provides information on area hotels, restaurants and attractions.